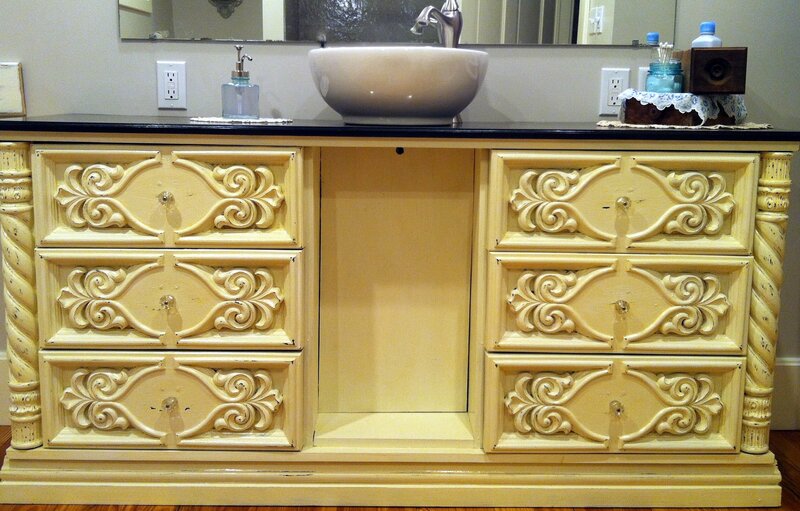 Several months before my bathroom remodel, I began looking for an old buffet, dresser, or something to repurpose as a vanity. Many impromptu stops at garage sales, junk stores and flea markets that threatened to give me fleas, was leaving me empty handed and frustrated. Hubby was not so sure about this idea, but I am one of those people that once I get an idea in my head I can’t easily discard it and start over; so the treasure hunt continued. While visiting my daughter & son in-law, I shared my dilemma. They were sure they could help me find something having many “junk” shops in their town. After visiting several businesses and about ready to give up, we saw another shop. 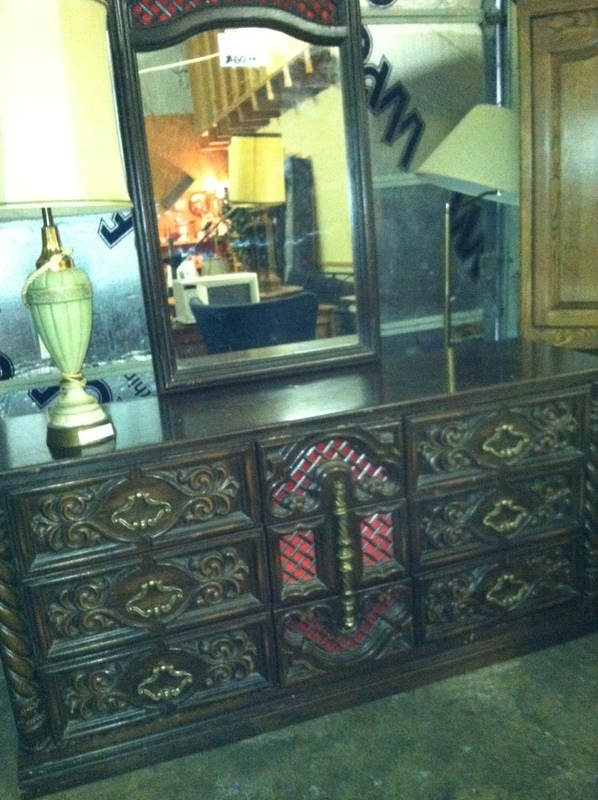 We looked and looked and finally found the perfect piece. When I showed it to the guys it was kind of hard to read their responses. They questioned, “THIS is what you want? Really?”, and “Are you sure you want THAT?” Once I convinced them that, “Yes, this is what I wanted.”, they willingly loaded it while I paid the cashier. The old dresser came as a package deal; three pieces for the price of one. Isn’t it a beauty?! Okay, okay…my husband wasn’t seeing it either. We got it home, unloaded into the garage where it sat for a few months. 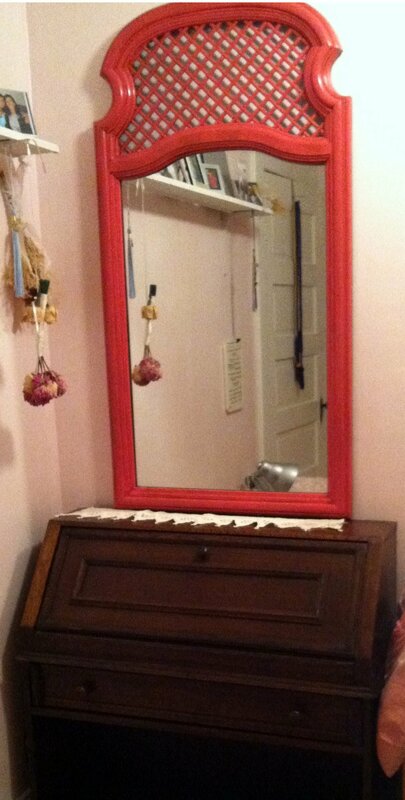 Like I said, I wanted the dresser to convert to a vanity. Not the bravest when it comes to paint and different techniques, it took awhile before I had the courage to begin. 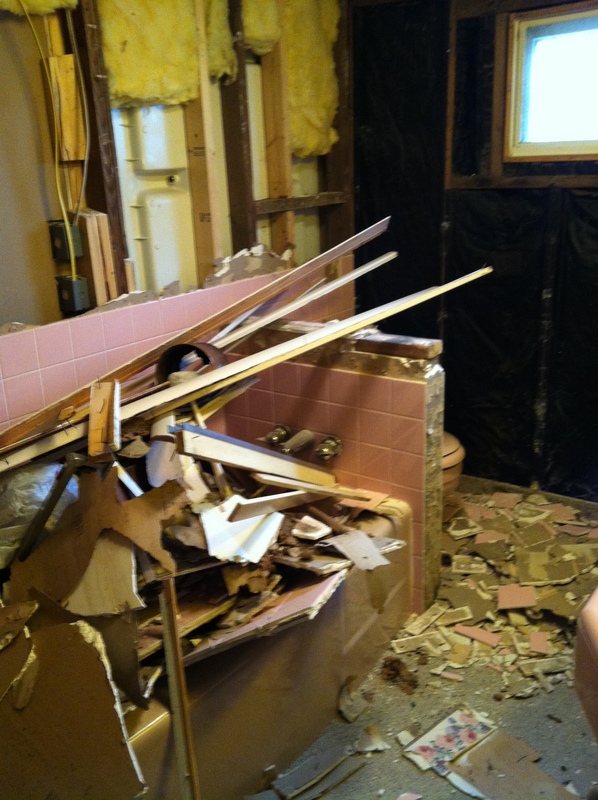 Once I started, the project was quickly finished and waiting for the carpenters to finish the bathroom. Gone are the gold handles and the red velveteen; the old has been made new. Plus, I think the distressed paint brings out the detail. I love how it looks! I did not use the mirror in the bathroom, because I wanted a wider mirror above the vanity. However, I did put it to good use. To give it a face lift, I again got rid of the red velveteen, and then spray painted it. I chose watermelon pink, and then aged it with a dark stain. This gives a wow factor in my daughter’s pale pink bedroom. I think she (and other guests) will enjoy the large mirror above the old writing desk that can be used as a dressing table. Again, the old was made new. I still have the bed headboard in the garage. I’ve thought of several things that could be done with it, but no decisions have been made yet. Do you have any ideas? You may not have an old piece needing to be made new, but what about you? How can you be renewed and transformed today? Thanksgiving is just around the corner. Have you been counting your blessings? Some of you will remember the Joy Dare I completed last year counting over 1,000 gifts from God throughout the year. Designed by Ann Voskamp with very specific gifts to look for, I was challenged to look outside the box and beyond the obvious. This challenge changed my outlook in many ways, including looking for the blessing in the most difficult eucharisteo. The eucharisteo that normally would make me ask, “How can there be any good blessing in this trial?” The Joy Dare also caused me to look for blessings in the smallest, minute things. Yes, indeed! He did, and I found it! Who helped God strategically place it, I may never know. This blessing has most likely been there for years without my noticing, and had I noticed when my kids were young I probably would have missed the blessing. My response would have not been the laughter that welled up in me, nor the fun group texting among the family. No, I would have been upset. and if no one fessed up, all four would have been in trouble! 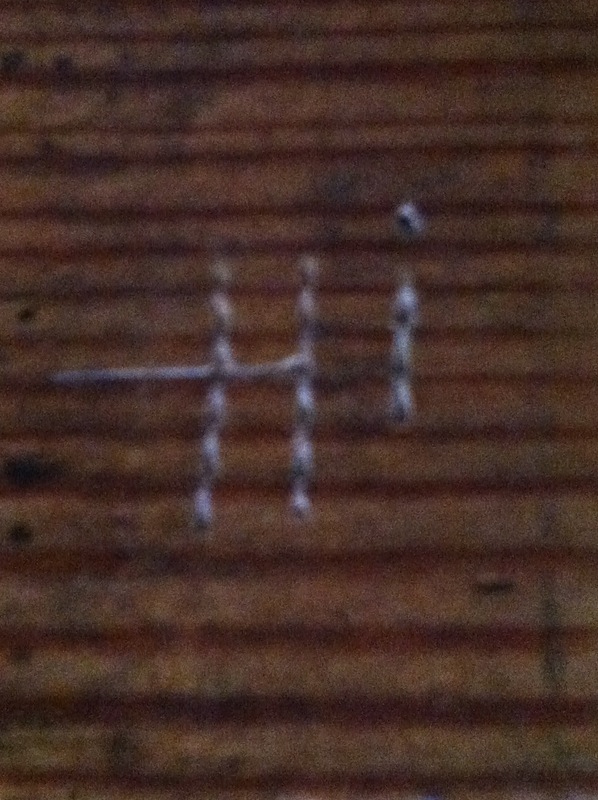 You see, I have never been a fan of carved-in-wood graffiti, especially when it is my wood floor!! This tiny little message is only two letters and 1/2″ x 1/2″. I discovered it carved into the floor of my upstairs hall. I have mopped that floor umpteen times through the years, yet this is the FIRST time I have ever noticed it. I do believe God has a sense of humor to give me this little greeting to brighten the day. This once too noisy home is now sometimes too silent even when I’m cleaning for a visit from my grown family. 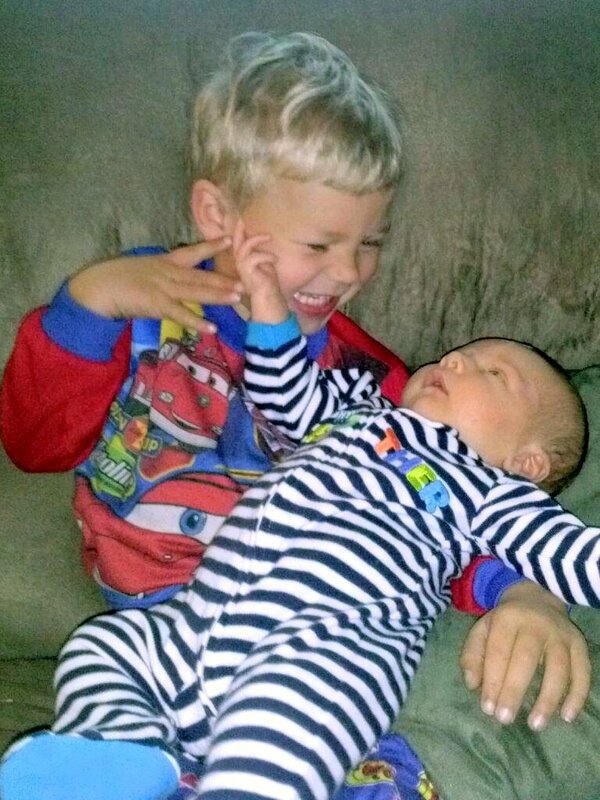 This little ‘hi’, sent me back to days gone by filled with the laughter of three ornery boys and their just as ornery sister. What sweet memories! What a blessing! Today, I am thankful for this tiny scratched message. Though it has been in plain sight all these years, God knew the perfect time to let me discover it.